Gerard Boylan, CEO of Top Oil. Gerard joined Top Oil as Financial Projects Manager in 1999, promoted through various roles including Finance Director & Commercial Director. He was appointed to General Manager Top Oil in 2006 and appointed Group Chief Executive in December 2009. Previously he worked with PricewaterhouseCoopers for eight years, culminating as a Senior Manager in Transactions Services Group specialising in Mergers and Acquisitions and Due Diligence assignments. Gerard is a qualified Chartered Accountant with degree in Accounting and Finance from Dublin City University (DCU). Ray joined Tedcastle Holdings as Development Director in 2000. He became Group CFO in 2002 and was appointed to the Tedcastle Holdings Board in 2006. Previously he worked for KPMG and was then a director in Davy Corporate Finance for nine years. Ray is a qualified Chartered Accountant with a Commerce degree from University College Dublin (UCD). Pat joined Top Oil in 2007 as Commercial Director with responsibility for the Finance, Credit and IT functions. Previously Pat trained as an accountant with BDO and qualified in 1993. He then worked in the Distribution sector with Rank Hovis McDougall and Unidare PLC. Prior to joining Tedcastles Pat was Finance Director for Irish Sugar from 2002 up to 2007. Pat is a qualified Chartered Accountant with a Commerce Degree from University College Dublin (UCD). Derek joined Top Oil in 2002 as a Project Accountant, and was promoted through various roles including Financial Projects Manager in 2004. . He was promoted to Financial Projects & Supply Manager in 2006 and subsequently promoted to Supply & Operations Director in 2012. Prior to joining Tedcastles, Derek was on a Training Contract with PricewaterhouseCoopers. Derek is a qualified Chartered Accountant with degree in Accounting & Finance from DCU (Dublin City University). Martin joined Top Oil in 1999 as a Business Development Manager for Londis Top Shop, and progressed to Regional Manager with Top Oil. He was promoted to Commercial Manager in 2007 and to Head of Sales & Marketing in 2011. Prior to working with TOP, Martin worked for Quinsworth, joining as a Trainee Manager and progressing to a Store Manager. He then worked for Cleland Supervalu as Store Manager and progressed to Group Buyer. Martin has a Diploma in Business Finance. Andrew has responsibility for Top Oil’s Direct fuels business across the company’s 22 depots nationwide. This includes the domestic, commercial, agricultural and wholesale sectors across Ireland in addition to the wholesale oil business in Northern Ireland. Andrew joined Top Oil in 2015 as Channel Sales Manager and took on responsibility for the Direct oil business in 2016. He previously held a number of sales and commercial positions across FMCG companies, most recently as managing director of John Player & Sons. Andrew holds a Diploma in Advance Marketing Techniques from Dublin Institute of Technology and a BSc management from Trinity College, Dublin. Nicola joined Top Oil as Manager of the Direct Business in 2003 with responsibility for nine depot locations, increasing to twenty two locations and currently also has responsibility for the Human Resources function. She previously worked for seven years with Field Marketing Ireland, spending the last two years as Client Service Director, with responsibility for 50 clients and 500 staff, including budget achievement, new business development, Human Resources function. Nicola has a Bachelor of Arts (UCD), Postgraduate Diploma in Business Studies (Michael Smurfit School of Business). 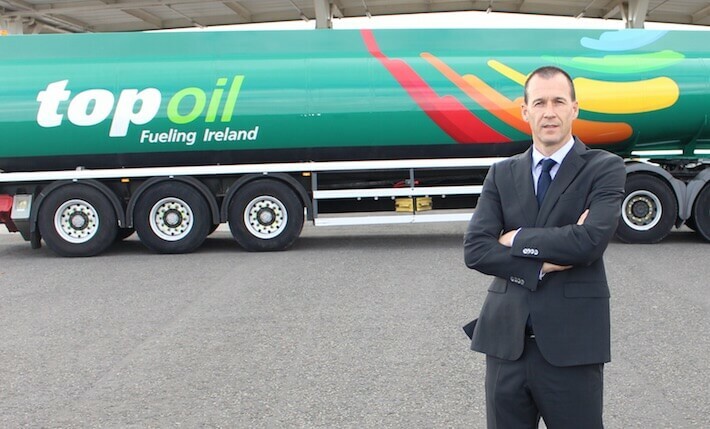 Michael joined Top Oil in 1998 as Business Development Manager for the West of Ireland and progressed to National Retail Manager. He was promoted to Commercial Manager – West in 2007 and in 2011 took back on the role of National Retail Manager. Previously, Michael was a Sales Representative for Bord na Mona in the West/Midlands region. Michael is an MMII Graduate (Marketing Institute of Ireland). Seamus joined Top Oil in 2001 as IT Manager, progressing to Group ICT Manager in 2008. Previous to this Seamus worked in Smith & Nephew Ltd as a Business System Manager for Ireland. Seamus has a Bachelor of Science in Financial Information Systems from Trinity College and a National Certificate in Computing from Sligo Regional Technical College. Ken joined Top Oil in 1997 and worked in various different roles culminating in his current role of Credit Manager. Before to joining Top Oil, Ken worked as a Customer Services Manager with Bord Na Mona Fuels Division. Ken is a Member of Institute of Accounting Technicians and The Irish Institute of Credit Management. Niall joined Top Oil in 1998 as a Financial Accountant, promoted through various roles including, Financial Reporting Accountant, Finance Development Manager, Business Reporting Applications Manager to his most recent role of Senior Business Analyst. Niall trained as an accountant in practice from 1991 to 1997 and joined KPMG as an Audit Senior in 1997. Niall is a qualified Chartered Certified Accountant and also has an Advanced Diploma in Project Management. In 2016, through DIT, Niall became a Master of Science in Computing specialising in Data Analytics.